The Asus Padfone, Asus Transformer Pad Infinity (TF700T) and the Asus Transformer Pad 300 series have all been priced in Italy. These prices are probably going to be the same across the continental EU (or at least in those countries that have the Euro as their currency). We also get rough release time frames for the three products. The Asus Padfone will unfortunately be extremely expensive. Thereâ€™s no other way to put it, really. Itâ€™s going to be â‚¬699. That includes the â€˜tabet dockâ€™, now called Padfone Station. So yes, in effect you are getting the (very rough) equivalent of two devices (a phone and a tablet), but the price will still manage to keep a lot of people away from the Padfone. Itâ€™s a shame. Anyway, the keyboard dock for the Padfone will be sold separately for â‚¬149. The Padfone should be in stores at the end of May. An LTE-capable version of the Padfone could be out by September. The Asus Transformer Pad Infinity (TF700T) will cost â‚¬599 and will be out on June 10. It will be Wi-Fi-only and come with 64 GB of built-in storage. The price doesnâ€™t include the optional keyboard dock. The Asus Transformer Pad 300, which is supposed to be the companyâ€™s most affordable new tablet, will sell for â‚¬399 (Wi-Fi-only), or â‚¬499 (Wi-Fi+3G). In both cases, the built-in storage space will be 32 GB. The Transformer Pad 300 will arrive on the market in mid-May. 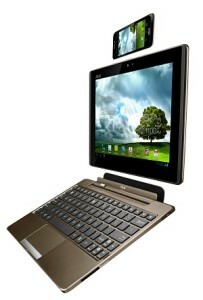 Asus is clearly pricing the Transformer Pad Infinity as a premium device. And the same could potentially be said about the Padfone. It remains to be seen, therefore, whether these two devices will have any mainstream success, or if theyâ€™ll just be a couple of interesting niche offerings. The 300 series, on the other hand, will get some decent pricing, yet not lower than the original Transformer. So itâ€™s probably going to be the best selling of this trio.